Cardiganshire: Cilcennin, Cilie Aeron, Cydplwyf, Dihewid, Henfynyw, Llanarth (2), Llanbadarn tref Eglwys, Llandewi Aberarth, Llandisilio Gogo (2), Llanwchaeron, Llanfihangel Ystrad, Llanina, Llanllwchaiarn, Llansaintfraed and Llannon. The population falling within the Union at the 1831 census had been 12,308 with parishes ranging in size from Llanwchaeron (population 233) to Llanarth (2,449). The average annual poor-rate expenditure for the period 1832-36 had been £3,619. 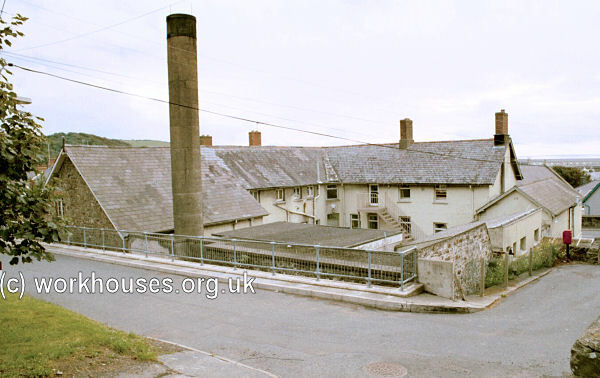 The Aberayron Union workhouse, for around 80 inmates, was built in 1838 on Princes' Street just to the east of the town. It was designed by the prolific George Wilkinson who was responsible for at least nine workhouses in Wales. The construction contract of £1,200 was awarded to local builder William Green. The building's location and layout are shown on the 1938 map below by which time the workhouse had become a Public Assistance Institution. The restrictions of its small site gave rise to a compact T-shaped design with four small yards for the different categories of inmate (two within each arm of the T). Aberayron front block from the south-west, 2000. Aberayron from the east, 2000. Aberayron form the south, 2000. Stephen Thomas of Mydroilyn, near Aberaeron, has kindly contributed an old photo (below) which belonged to his grandmother and which is inscribed 'Inmates at Aberaeron Workhouse'. The man standing is said to be 'Ianto dybaco' (Ianto is a variation of the name Ifan or Evan, and dybaco is Welsh for tobacco). Aberayron inmates, early 20th century. Also from that period comes a 1914 photograph of the Union's Board of Guardians, together presumably with the officers of the workhouse. 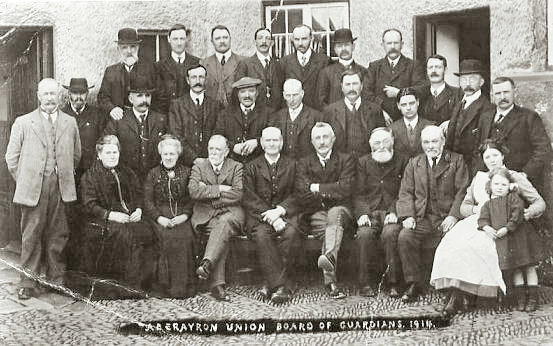 Aberayron Board of Guardians, 1914. 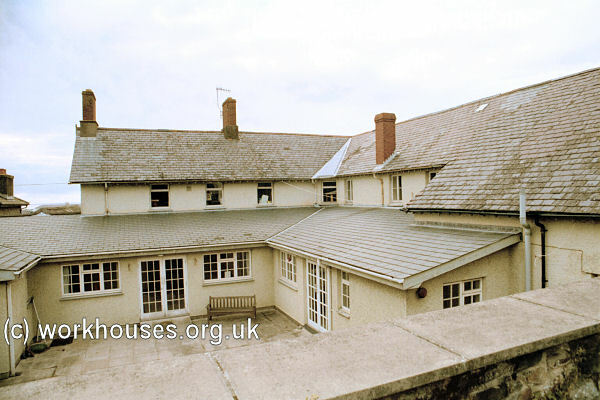 In 1914, the workhouse was converted to a cottage hospital. In the latter part of the First World War, it provided care for injured soldiers. 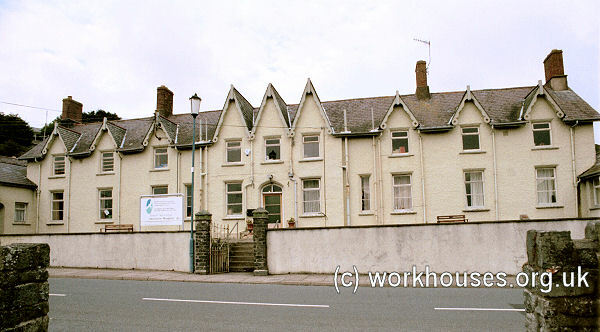 The former workhouse building now houses a local medical centre. Ceredigion Archives, Old Town Hall, Queen's Square, Aberystwyth, Ceredigion SY23 2EB. The few surviving records include: Guardians' minute books (1837-1930); Financial records (1837-1930); Vaccination records (1899-1919); etc. 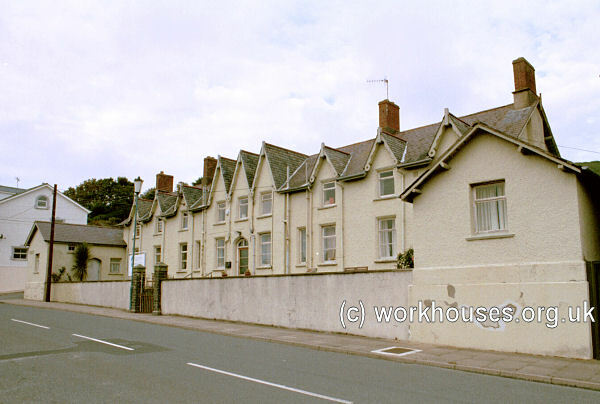 National Library of Wales, Penglais Road, Aberystwyth, Wales SY23 3BU. Has some original building plans.